The start of the Ilocos Norte Tourist Attractions is the drive into Laoag City across the Gilbert Bridge and under the city entrance, with the familiar Hollywood inspired Laoag City sign on the hill. There are so many sights and sounds to experience in Laoag and it suits walking tours, tricycle tours and even slow calesa (horse-drawn carriage) tours and a city tour will set you back about P10-15 pesos per passenger. One of the most popular Ilocos Norte Tourist Attractions is the central market. This is located in a purpose built 3 level building that replaced the original old public market. There are many stands selling all types of merchandise, and its an eye opening adventure. 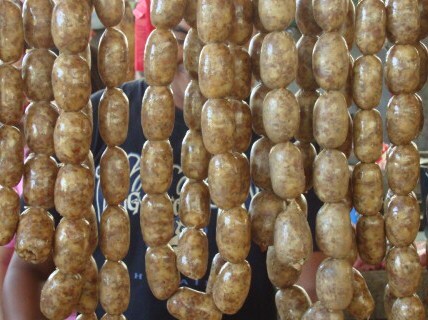 You can look at and buy the many ingredients for great Ilocano food dishes. Why not buy some Chichacorn crunchy corn bits or some sweet potato chips and the central market is regarded as the best place to buy pasalubongs. You can also buy native hats, along with bags and shoes. Many of the items here are not seen in the large Manila markets. The Ilocos Norte Tourist Attractions are in and near Laoag. Check out the really great dried fish and shrimp sections of the market. Near this is that ever so tempting bagnet double deep fried pork belly ( I love it and so does my waistline!) and the delicious longganisa home-cooked Laoag style pork sausages with sukang iloco sugar cane vinegar and garlic, and all the vendors are promoting their own special varieties and styles of seasoning timpla. 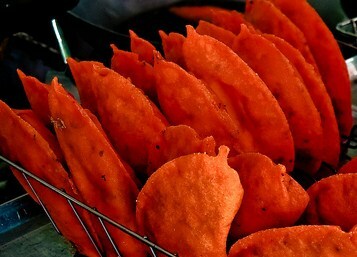 Dont forget to also visit nearby BATAC and home to the famous Empanada, which you absolutely have to try, they are very delicious. Click on the link for more details about these two important tourist attractions THE SINKING BELL TOWER and ST WILLIAM’S CATHEDRAL as it is worth the effort to see. Ilocos Norte Tourist Attractions. These dishes are found at the various food stalls carinderias in the market. There is dinardaraan or dinuguan, which is pork meat and blood cooked with spices and vinegar, and of course Ilocos special pinakbet which is a mix of garden vegetables stewed with fish sauce or shrimp paste known as bagoong. Also buy some snacks of cornik which are those tasty crispy fried corn, and also basi which is Ilocano sugar cane wine aged in earthen jars, and what ever you do taste the local empanada, the best stand is just outside and across from the market entrance steps. The Ilocos Norte Tourist Attractions are in and near Laoag. 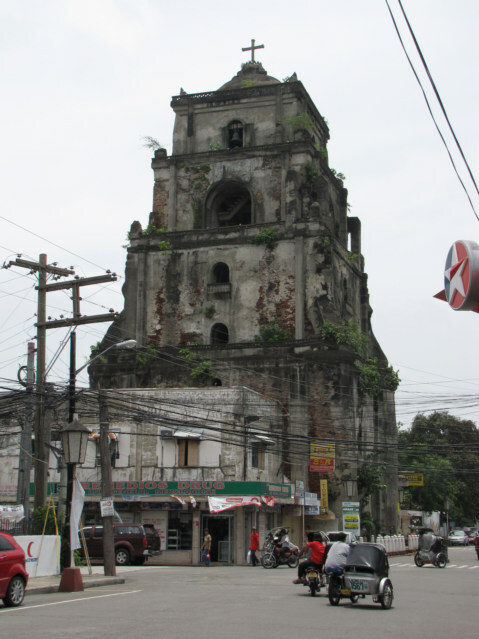 This was constructed 1918 by the governor Don Florencio Castro and inaugurated in 1924. It was then enlarged and underwent a renovation in 1957 when two additional wings were added during the Governor Antonio Raquiza administration. 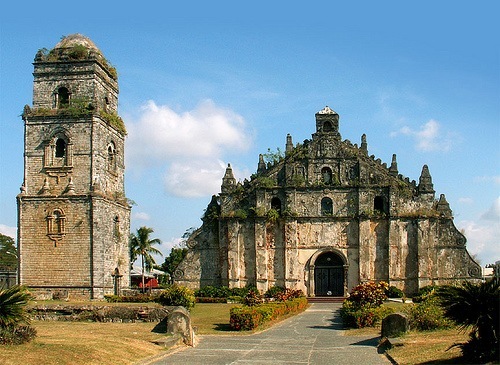 The Ilocos Norte Tourist Attractions are in and near Laoag. 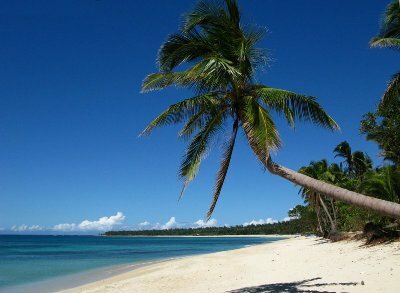 Ilocos Norte Tourist Attractions. The statue of Jose Rizal was erected in 1957 by the Ilocos Norte Teachers Club and the citizens of Ilocos Norte. The park was also later restored and renovated and a playground, swimming pool, picnic area and a mini zoo were added. For those who do not know Philippine history, Jose Rizal is regarded as the national hero of the Philippines. He was committed to political and social reforms in the Philippines and had several works on Filipino nationalism published in Europe. He was stridently critical of the powerful Spanish clergy and this provoked those in power. At the outset of the Philippine Revolution in 1896, Jose Rizal’s many enemies soon fabricated a case against him and he was jailed in Fort Santiago, had a mock trial for rebellion and sedition and then was executed by firing squad at the age of 35. His poem known as Ultimo Adios is considered a national masterpiece that reflects the aspirations and love of country that all Filipinos subscribe to. Make sure you visit all the Ilocos Norte Tourist Attractions. This building has a Spanish Colonial heritage and is located to the left of the Gilbert Bridge when travelling into town. It was restored under the administration of Hon. Mayor, Atty. Rodolfo C. Fariñas. The building is Italian inspired architecture constructed from bricks. The Ilocos Norte Tourist Attractions are in and near Laoag. There are some great Ilocos Norte Tourist Attractions. This is the only monument of its type in the Philippines. It is both tall and slender and was erected in 1882. The monument is to commemorate the gratitude of the people of the Province of Ilocos Norte to his Majesty King Alfonso XIIL Q. D.G., for lifting the 100 year tobacco monopoly by royal decree that was enforced in Northern Luzon between the years 1782 to 1881. Under the monopoly the local Ilocano farmers were forced to plant and harvest tobacco. This was established in 1782 by the Governor Jose Basco y Vargas by royal decree and the aim was to reap large profits for the government and also make the Philippines the worlds leading tobacco producer. Tobacco still remains a major local industry in Ilocos Norte. The Museo Ilocos Norte was established in 1999 and showcases the various ethnic groups of Ilocos including the Yapayaos, Itnegs and Igorots. It is called Gameng after the Iloko word meaning treasure. The Museum building as also a heritage item as the building was a centuries old restored Camarin de Tabacco dela Tabacalera, which was a tobacco factory and warehouse during the Spanish era. The museum collection includes many artifacts from throughout the Ilocos Norte region. The museum features the lifestyles of the Ilocos early inhabitants and the various ethnic groups, along with tools and utensils they used. The museum is divided into 15 main sections that showcase Ilocanos as farmers, fishermen and highlands people; the various towns of Ilocos Norte; the many market items; historical highlights; the Abel Iloko cloth; Pugon; musical instruments and also Ilocos musical traditions. A highlight of the museum is the replica Ilocano ancestral house. The Aurora Park is located south of the Ilocos Norte Capitol and at the center is the statue of the maiden Pamulinawen which is located at the top of a lovely fountain. Who is Pamulinawen? Pamulinawen was reputedly a beautiful stone, which was oval in shape and the size of a human heart. It was solid, smooth and unbreakable and was compared to a beautiful lady possessing a good and sterling character, that had never been engaged, or loved, or kissed and had never been disgraced. Pamulinawen is also a popular Ilocano folk music and lyrical style. There is Pamulinawen Festival held each February in Laoag City with a Pamulinawen pageant. The best Ilocos Norte Tourist Attractions are in and near Laoag City. The La Paz dunes have a panoramic view over the South China Sea. The dunes are from 10 to 30 metres in height are also known locally as Bantay Bimmaboy, and this refers to a perception that the dunes resemble pigs in shape. The area is also known as the Desert of the North. The dunes comprise 85 square km (52 square miles) of coastal sand and beach. They are very popular with movie makers and some scenes from Born on the Fourth of July and Mad Max as well as many Filipino movies have been filmed here. The dunes are a protected geological monument due to the unique land formation. 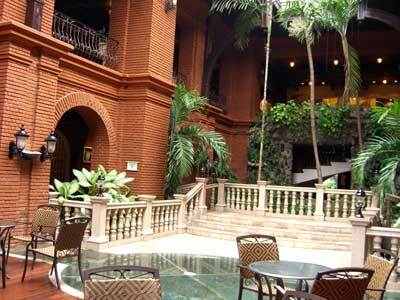 There are many Ilocos Norte Tourist Attractions are in and near Laoag. Laoag City has only one casino with 14 tables and is open 24 hours a day with multilingual attendants. The have a variety of different club rooms to wager in. There is the American Club with its New York and Broadway feel. The British Club has the very Victorian Era theme and the hall is designed on Buckingham Palace. The French Club is very elegant and aristocratic the wall marbles reflect the chandeliers, all very Louis XIV. The Chinese Club is all Qing Dynasty with rosewood and very strong Chinese motif. Then there is a club room with a strong Spanish style. Finally there is a very Roman type club room and very old imperial Rome style. All very nice to take a chance against Lady Luck. 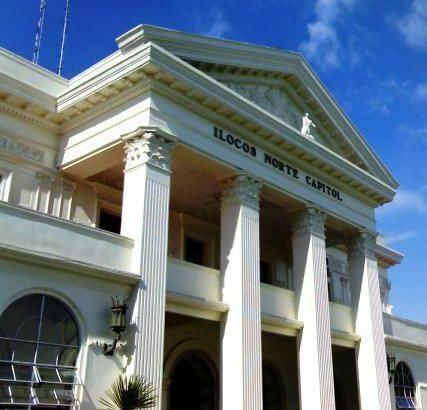 The Ilocos Norte Tourist Attractions are in and near Laoag. There is a garden known as the Hidden Garden and it is a plant nursery that you can walk through. They have a cafe serves really great Halo-Halo. Halo-Halo is shaved ice, ice cream, tapioca balls and jelly. It’s a relaxing spot to take some time out. Make sure you have a Halo-Halo!